Gradueted from Govt. Colege of Art, Kolkata. Post-Graduation from Govt. College of Art, KOlkata. diploma in teaching of Art. The middle class clings to its roots and beliefs more than anyone else, it is these legends and this behavior that I have tried to portray on canvas." Paresh Hazra is a storyteller, except his stories are told on the canvas, and he celebrates the age-old family traditions of , in his paintings. 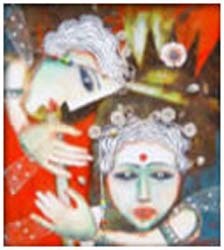 Hazra's paintings reflect the attributes of the old Indian artists, minute in detail and lavishly painted and textured. Striving to keep alive the myth of the great Indian family, with its close knit relationships and ethos of mutual aid, he paints what he feels with conviction. Hazra, with a great deal of effort, produces colours and textures from natural ingredients. Using egg-tempera in preference to oils, he uses these natural pigments and dyes to achieve brilliant colour. A bit of jute or gauze is usually added to his painting to add another dimension to his work. 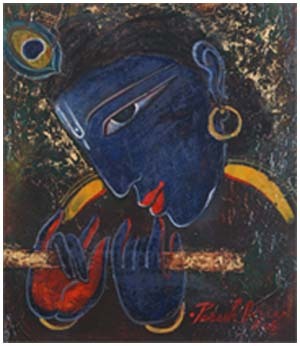 "This technique gives an uneven look to the characters inhabiting the painting, thus producing an effect of theatricality," says Hazra. In fact, all of his creations have a theatrical quality about them. The people always look as if they have their faces to the audience even when it is not actually so. Gestures, expressions, movements, all have a disjointed appearance, making the figures resemble puppets being manipulated by an unknown hand. 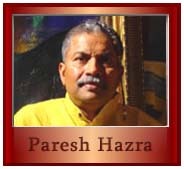 Hazra has exhibited his work in group shows in Bangalore, Delhi, Calcutta, Dubai, Kathmandu, Hong Kong, New York and the He has had solo exhibitions in Mumbai, Bangalore, and Calcutta. He is a recipient of the awards of Oriental Art Society, Calcutta. His works are in the collections of the Lalit Kala Akademi, Delhi and at the National Gallery of Modern Art, Delhi. He currently lives and works in Bangalore. 1983 : Karnataka Chitrakala Parishat, Bangalore. 1984 : Max Mueller Bhavan, Bangalore. 1989 : Chitrakoot Art Gallery , Calcutta. 1990 : K.C.Das , Bangalore. 1991 : Gallery Katayun, Calcutta. 1991 : The GAllery, Chennai. 1992 : Alliance Francaise, Pondicherry. 1992 : Young Design, Bangalore. 1993 : Gallery Katayun, Calcutta. 1993 : Allicance Francaise, Pondicherry. 1994 : India International Centre, Delhi. 1995 : Jehangir Art Gallery , Mumbai. 1995 : R & B Gallery, Bangalore. 1996 : Gallery Katayun, Calcutta. 1997 : Allicance Francaise, Bangalore. 1997 : Taj Gallery, Mumbai. 1998 : Jehangir Art Gallery , Mumbai. 1998 : Windsor Manor, Bangalore. 1999 : Art Chamber, Goa. 1999 : Art Today, Delhi. 2000 : Right line Art gallery, Bangalore. 2000 : Crimson Art Gallery , Mumbai. 2001 : Jehangir Art gallery, Mumbai. 2001 : Windsor Manor, Bangalore. 2001 : Taj Hotel, Mumbai. 2001 : Art Indus, Delhi. 2002 : Gallery Satya, Mumbai. 2002 : Right lines, Le Maridian, Bangalore. 2003 : World Fine Art Gallery , Ney York. 2003 : International Art Expo, NY. 2003 : Toronto university, Canada. 2003 : Paul Getty’s residence, California.